This is a man who spent much of 1970-71 in Belgium’s national library absorbing British computer research. He was learning French too in Brussels, so that he could use French to teach math, physics and economics at a Congolese mission school. This is a man who lived with his wife in a mud hut for two years – so remote in the eastern Congo that they needed to fly there in a small plane over a tree canopy as thick as broccoli heads packed together. This is a man who got into a grad program at Duke University almost immediately after applying – far past any published deadlines, just a month before classes began. An intellectually provocative paper won him admission. This is a man who made the world-renowned Rosetta Stone language-learning system possible through his computer know-how and vision. 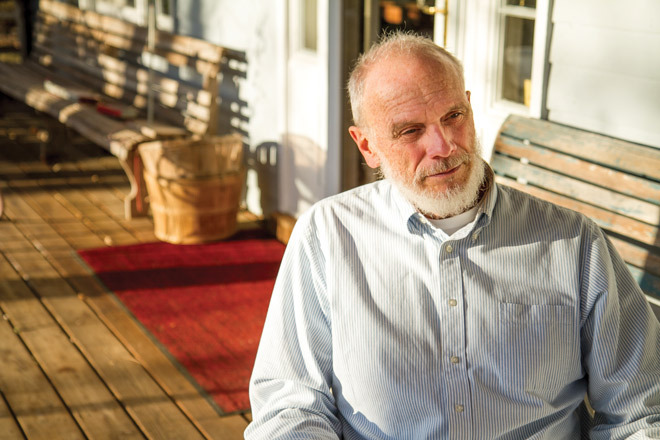 The life of John Fairfield ’70 could read like novel, if he chose to write it up. Fairfield’s introduction to computers occurred during his 1968-69 year abroad at 400-year-old University of Marburg, where he was asked to use Fortran to do a linguistic analysis of Italian poetry. He would walk into Marburg’s computer center – with its massive mainframe attended by people in white lab coats – and hand in his punch cards for processing, then later retrieve reams of resulting printouts. Back at Eastern Mennonite College in 1969-70, Fairfield presented his eclectic array of coursework to the dean, Ira Miller, and asked, “How do I graduate?” Fairfield didn’t have enough chemistry courses to be a chemistry major – he had tested out of some of them. He knew German fluently, but needed another language to be a language major (French would be learned the following year). So he and Miller settled on “natural science” as his major. Jumping to Duke University, Fairfield continued to be an unorthodox student while working full-time. (He and wife Kathryn Stoltzfus ’70, who eventually became a Duke law student, had two children while they were both in grad school.) Duke’s fledgling computer science program relied heavily on faculty drawn from other fields – as was common during the birthing stage of computer academia. No Duke professor was involved in machine perception, the topic Fairfield decided to pursue, with or without their support. Upon completing his not-understood dissertation, Fairfield had no assurance that the Duke faculty was going to grant him his PhD. He sent it to David Waltz, a renowned computer vision pioneer then at the University of Illinois, Urbana -Champaign, who grasped its importance. Waltz sent word back to Duke that he had granted PhDs for much less than what he saw in Fairfield’s work, and Fairfield got his doctorate. Next came faculty appointments at James Madison University, where Fairfield remained for nearly 20 years, teaching all kinds of computer science courses, but especially relishing the 400-level research courses. In 1992, Fairfield added his energy and talents to those of brother-in-laws Allen ’65 and Eugene ’72 Stoltzfus, plus Greg Keim, to give birth to a worldwide business now known simply as Rosetta Stone. Fairfield retired in 2006 when the company was sold to financial investors. Fairfield then shifted his focus to envisioning and establishing EMU’s Center for Interfaith Engagement, where he remains active as a research fellow. He is the author of The Healer Messiah: Turning Enemies Into Trustworthy Opponents (April 2014, available at rruuaacchh.org).